LED Lenser SEO 7R Reviewed - To Buy or Not in Apr 2019? Headlamps, torches, running lights — whatever you call them, a head-mounted light for traversing the ground, whether familiar or foreign, in the unknown darkness is a necessity for night runners and those who prefer to explore in low-light conditions. Optimal for easy to medium terrains—the streets of your town and light trails—the LED Lenser SEO 7R is a headlamp that offers a comfortable hands-free lighting source that provides a solid, powerful beam of light to illuminate the path ahead. This USB-rechargeable headlamp is loaded with lighting tech to provide runners with one of the brightest lamps on the market. Featuring Advanced Focus System (AFS), which combines lens with a reflector to produce either a floodlight or a spotlight, a versatile option that adapts to a host of lighting needs. The LED Lenser SEO 7R also features Smart Light Technology, which allows users to cycle through the various default lighting output options. In addition, OPTISENSE technology allows the headlamp to gauge needed light intensity and automatically adjusts to that perceived need. The light sits on a swivel for the user to customize direction for optimal lighting direction. Made of durable, sturdy materials, the SEO 7R is a headlamp that seeks to fit a wide variety of potential lighting needs that will be found while running through the dark. The LED Lenser SEO 7R is meant to provide hands-free illumination for runners who will be traveling in low-light conditions on easy to the mild terrain. Reviewers have used the SEO 7R many real-world conditions to test its durability and ability to light their path, and the results are encouraging. One reviewer tested the SEO 7R while on a 100-mile journey that included mountain climbing and technical terrain throughout, and he reported that this headlamp performed admirably. With a customizable fit and a host of lighting options—from auto-sensor to various presets to an adjust floodlight that can produce everything from a spotlight to a flood light, the SEO 7R aims to perform in demanding conditions at moments when runner and adventurers alike depend on their headlamp to keep the lights on. Possibly the most universal complaint of the LED Lenser SEO 7R is the unforgiving components of which it’s made. While it is a lightweight headlamp, it is also made of hard plastic materials that don’t particularly sit comfortably for long periods of time. That said, it’s also made of lightweight electronic hardware, and lighting components that keep the head free and open without confinement, so for runners in the dark, warm climes won’t worry about overheating while wearing the SEO 7R. As stated in the previous section, SEO 7R has not received high marks for its overall comfort. While lightweight and comfortable enough once it’s secured, the SEO 7R tends to wear poorly for long periods of time and many reviewers have singled this out as this headlamp’s worst feature. The hard plastic components that comprise its structure is uncomfortable against the skin for long stretches, while may limit the appeal of the SEO 7R for some runners. 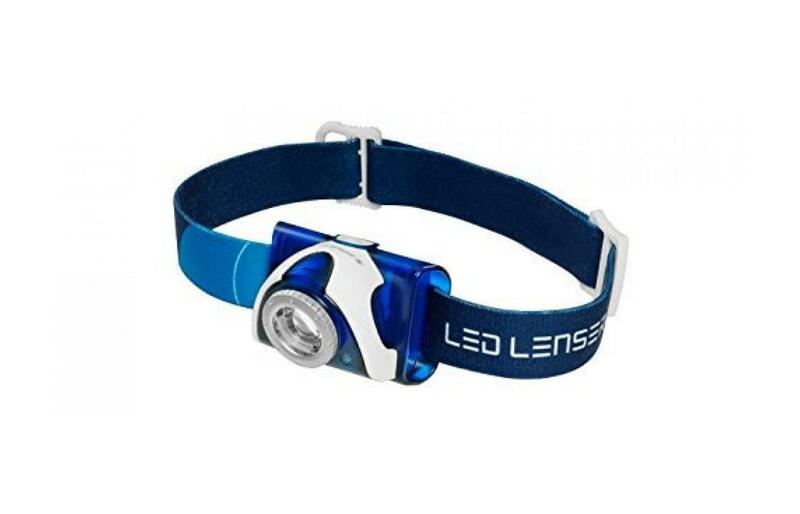 Weighing in at just 105 grams, the LED Lenser SEO 7R is an incredibly lightweight headlamp that helps runners forget about the thing strapped to their head providing light. With just a strap around the head, the adjustable band easily secures the SEO 7R on any size and keeps it firmly in place. The light component itself is also similarly small but offers a great versatility of lighting options. Everything about the SEO 7R is made of synthetic materials, which speaks to its high durability. With a synthetic band made of plastic and elastic and a plastic lighting unit that would be difficult to break down unless one’s express purpose was to destroy it, the SEO 7R is made from materials to last in a variety of climes and conditions. The only downside to this headlamp is its purported short battery life, in which its rechargeable battery only stores 5 hours of juice before flaming out. One way to get around this problem is to carry some spare standard batteries, which the unit also takes. Being a relatively straightforward device with only one express purpose—to serve as a dynamic headlamp for nighttime activities—there are few accessories that are explicitly paired with the SEO 7R. Perhaps the only one that comes to mind is a replaceable rechargeable battery, but that’s really more for function than adding anything to the experience. It’s almost admirable at how German LED Lenser designed the SEO 7R to be so straightforward. In an age where it seems every brand of sports equipment is trying to figure out the next new angle to take, or extraneous function or stylistic flourish they can add to every product, the SEO 7R is elegant in its simplicity: it’s a headlamp with a head strap and that’s pretty much it. Blue and white, the SEO 7R is made for utility and ease of use, not in being flashy or coming across as a deluxe item. Where function meets form, the SEO 7R meets the essence of being a headlamp. The long-lasting LED light and variety of light functions the SEO 7R offers translates to a price point that’s maybe a little more than one would hope but not nearly as expensive as other, more deluxe headlamp options. For a durable, tech-loaded headlamp that can automatically adjust and provide the lighting one needs to be based on specific conditions that also provides a powerful — but customizable—light, the SEO 7R is just at the right price point to guarantee quality and deliver a more dynamic lighting unit for nighttime runs. German-based LED Lenser obviously puts a great amount of thought into the overall design and features of their SEO 7R. Their rechargeable headlamp features the Advanced Focus System (AFS) that provides either a powerful flood beam or long-distance focused spotlight; its Optisense technology automatically dims or brightens the strength of the light based on real-time conditions. Lightweight, easy to put on or take off, and packed with some excellent lighting features, the SEO 7R is a great light for easy to medium terrains and has been tested for its ability to illuminate difficult paths to great success. At a price point that doesn’t break the bank, aside from its at times somewhat uncomfortable casing and with purported short battery life (which can easily be fixed by carrying a few spare standard batteries just in case), the LED Senser SEO 7R is a headlamp that will keep your path bright and shine for many miles.